After Somalia, the military recognized a need for a more protected HMMWV and AM General developed the M1114, an armored HMMWV to withstand small arms fire. The M1114 has been in limited production since 1996, seeing limited use in the Balkans before deployment to the Middle East. This design is superior to the M998 with a larger, more powerful turbocharged engine, air conditioning, and a strengthened suspension system. More importantly, it boasts a fully armored passenger area protected by hardened steel and bullet-resistant glass. With the increase in direct attacks and guerrilla warfare in Iraq, AM General has diverted the majority of its manufacturing power to producing these vehicles. M1113 The M1113 has been selected by the Army as its A2 chassis for HMMWV purchases. Currently, the ECV is used for special operations vehicles and communications shelter carriers. During 1995, production of the M1114 based on the improved ECV chassis began. The M1114 meets Army requirements for a scout, military police, and explosive ordnance disposal vehicle with improved ballistic protection levels. The M1114 provides protection against 7.62 mm armor-piercing projectiles, 155 mm artillery air bursts and 12 lb. anti-tank mine blasts. The U.S. Air Force has a number of vehicles under the designation M1116, specifically designed to meet the requirements of the Air Force. The M1116 features an expanded cargo area, armored housing for the turret gunner and increased interior heating and air conditioning system. The M1114 and M1116 receive armor at O'Gara-Hess & Eisenhardt Armoring Company of Fairfield, Ohio. By now, most of you are aware of the positive reputation that Bronco has with the modeling public. 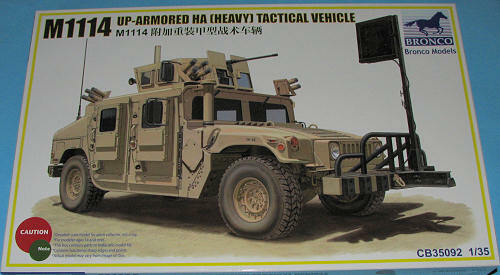 This new kit is, of course, the new up-armored HMMWV (which you notice isn't in the title to keep from paying royalties). The kit comes in a box that would fit two complete kits side by side save the fact that the main chassis piece and the tires come in their own protective cardboard container. 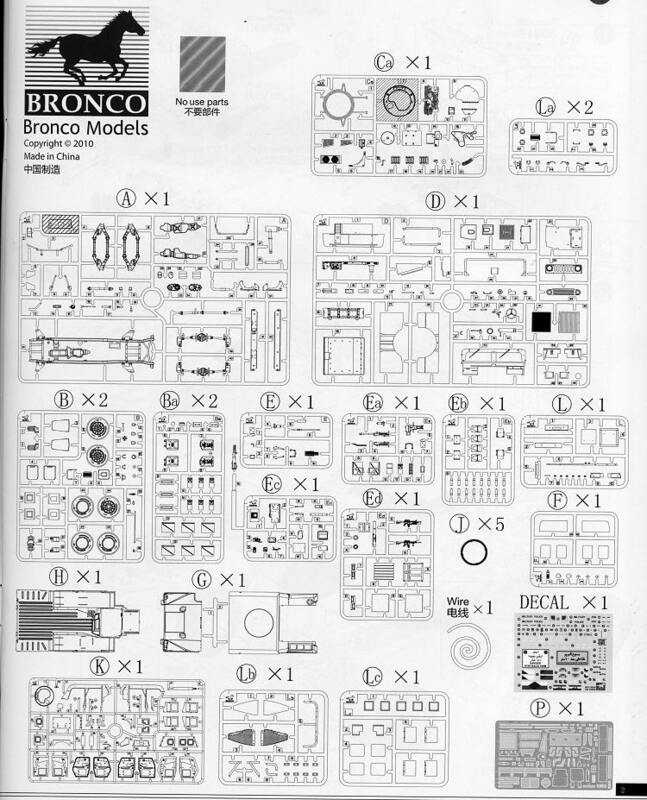 Molded in a tan plastic, undoubtedly to make it easier to paint, the kit has 13 different sprues, some of which are provided as duplicates, mostly for chassis bits, wheels, and accessories. Molding is excellent with superb detail that is very much up to standards. There is a nicely done photo etch sheet with plastic on both sides to help in cutting. A nicely done decal sheet provides for one of four markings options. Despite the rather high parts count, this one is a curbside with no engine. However, that in no way means it is lacking in detail. The chassis is highly detailed as is the interior and even the bed area. There is so much 'stuff' in this vehicle, it is difficult to see how it could actually carry anyone! However, I'm thinking this is a three man crew with driver, co-driver and gunner, though those who know more than I are free to correct me. I particularly like the way the wheel/tire set up is done with the main tread being a separate piece from wheel/sidewall assembly. No worries about seams across the treads. The scabbed on pieces are separate from the rest of the vehicle so you do apply the bits pretty much after the rest of the vehicle is assembled, just like on the real deal. Photo etch is provided fore a number ofpieces, including screens that will be seen behind louvered sections of the bodywork. There are not a lot of optional parts, but those provided, like the option to have the doors and tailgate open or closed, are clearly marked. The kit also comes with a lot of accessories like guns, ammo cans, fuel cans and such so that you can make the vehicle seem even more busy. 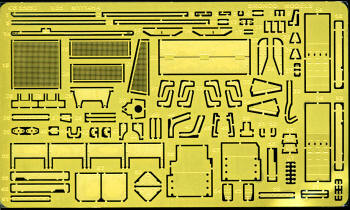 As it is the Heavy version, there are a considerable number of additional pieces to use compared to the basic kit. This includes the extended front bumper with whatever that is in the front (road-side bomb detector? ), as well as the additional roof housing, to name but a couple of the most visible additions. Instructions are very good with several sections in full color. There are 31 well drawn construction steps with generic color information provided where needed during construction. There is only a basic vehicle painting and markings diagram. 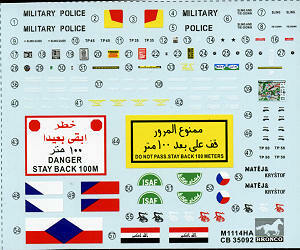 Though the decal sheet shows that there a number of options, including an Iraqi Army one, there is no placement guide for any of these. 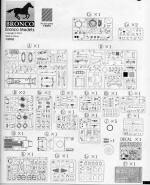 The decal sheet that is provided is well printed and in register. Those into building modern military vehicles should be quite pleased to have this new kit available. Its complexity might be a bit much for a new modeler, but those with experience should find it to be a very pleasant build. Thanks to www.dragonmodelsusa.com for the preview kit. Get yours at your local retailer today.